And don't know when we will be back again. LOL! Ok I guess we are ready to go. 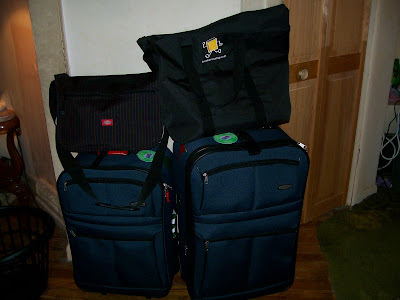 Got our bags packed as you can see by the picture. All that's left is to throw a few more stuff in our bags, wait til Matt gets out of school, stupid retreat! and we are off to the airport. I tested the e-mail blogger on my test blog and I can text message stuff to this blog here. The pictures will have to wait til I see Cherie for her to show me. But if Matt and I see that we have time and are bored, as I get at times. I'll text message something between flights.